Happy Monday! Wow, can you believe it? Does each weekend keep going faster and faster, or is it just me? I had a wonderful weekend with family and friends. Saturday, my boyfriend, brother-in-law, Emma, and I drove down to Iowa to celebrate my grandmother’s 90th birthday, a month early, but it was a great weekend for travel and we are worried about getting everyone together in the upcoming months (you know because of the “s” word…). Always an amazing time with family, but seems to go too fast each and every time! Yesterday was a gorgeous day, we spent some time outside, cleaning, and going to a comedy show called Triple Espresso! It was really entertaining and I highly recommend it if you are in the Minneapolis area. We went there for our friend’s birthday, and then finished the night with take-out Chinese. I wore this poncho, which was beyond comfortable for watching a show – it felt like I had my own blanket with me. 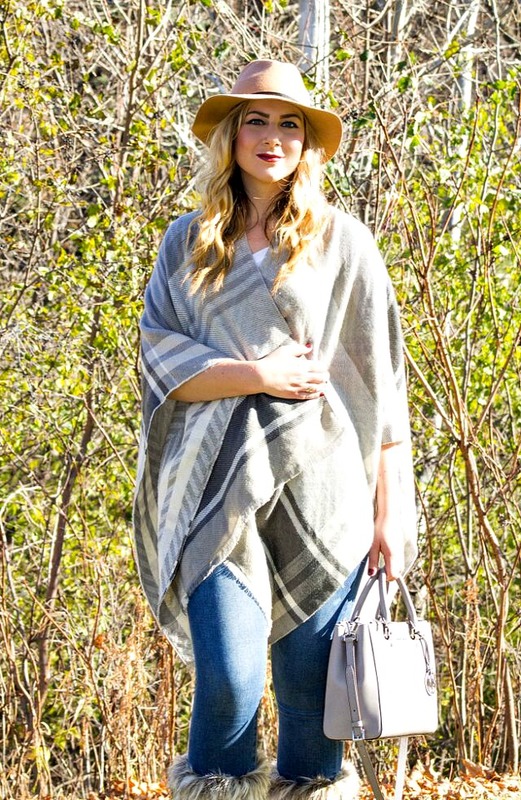 This BP poncho from Nordstrom Rack is sold out, but a super similar one that Emily wore last week is now available at Nordstrom, still the BP brand too! My new furry boot cuffs to add some more detail to my outfit – aren’t they cute! These faux fur boot cuffs will be perfect for extra warmth and that little something extra to my outfit. I can literally transform any pair of boots into boots with the fur – the whole club… yes you know where I’m going with this! Anyway, hope you have a fabulous week! I would be lying if I said it was easy getting up this morning, but so much to look forward to. I hope you have a fabulous week! That poncho is so cute, Rachel! Love it. Also, finishing the day with take-out Chinese is always a good idea. Love that poncho girl! I’m clicking through to check it out now. I’ve been wanting to pick up a similar one for a while. Ahh that poncho is perfect! I love the color so much! You look amazing in that poncho! So cozy and perfect for fall! Love the gray colors in it!